Former California Gov. Arnold Schwarzenegger speaks at a rally outside the U.S. Supreme Court in Washington, Tuesday, Oct. 3, 2017. The Supreme Court heard arguments in a case about political maps in Wisconsin that could affect elections across the country. WASHINGTON (ASSOCIATED PRESS) — In a case that could reshape American politics, the Supreme Court appeared split Tuesday on whether Wisconsin Republicans gave themselves an unfair advantage when they drew political maps to last a decade. If Justice Anthony Kennedy, whose vote almost certainly controls the outcome, is prepared to join his liberal colleagues, the court could rule for the first time that districting plans that entrench one party's control of a legislature or congressional delegation can violate the constitutional rights of the other party's voters. That could lead to changes in political maps across the country. Without the court's intervention, Smith said on behalf of the Democratic voters, the next round of redistricting after the 2020 census will see far more extreme partisan maps. "You are the only institution in the United States that can solve this problem just as democracy is about to get worse," Smith said. "You paint a very dire picture," Justice Samuel Alito replied dryly. He seemed unpersuaded. The conservative justices were skeptical about striking down the state's map or even involving courts in the inherently political process of redistricting. Chief Justice John Roberts worried about involving the Supreme Court in a glut of partisan redistricting claims that would follow if the Wisconsin Democrats prevail. "We'll have to decide in every case whether the Democrats win or the Republicans win," Roberts said, a scenario that he said would damage the court's credibility. The liberal justices appeared to favor the Democratic voters who challenged the Wisconsin plan. Republicans who controlled the legislature and the governor's office adopted electoral maps that have given themselves a significant advantage in the state Assembly in a state that is otherwise roughly divided between the parties. "What becomes of the precious right to vote?" she asked. Representing Wisconsin, Misha Tseytlin urged the court not to succumb to the other side's "scare tactics about what will happen next." People waited in line for hours for a chance to view the argument on the second day of the court's term. Roberts turned down a request for live audio of the argument. The packed house included former California Gov. 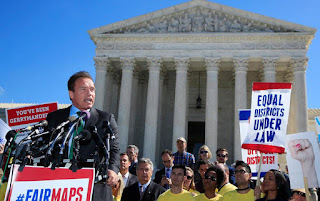 Arnold Schwarzenegger, among a handful of prominent Republicans who want the court to rein in partisan redistricting. 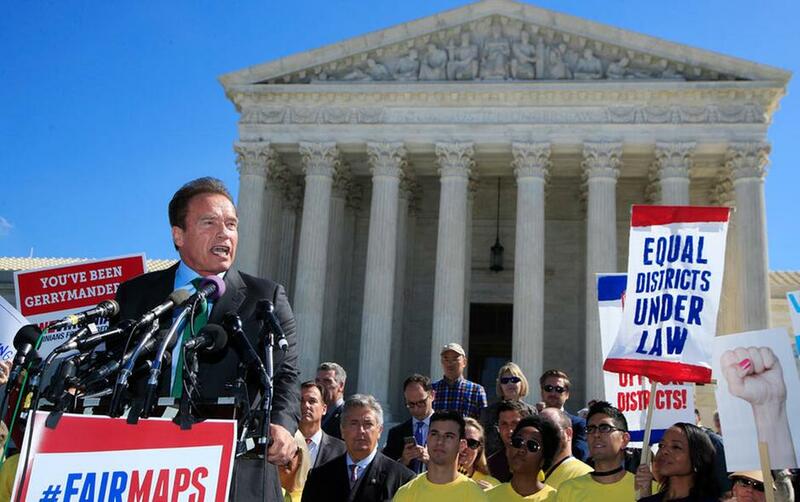 The Supreme Court has never thrown out a political map because it is too partisan. Courts have struck down districts as racially biased for decades, and other partisan districting lawsuits are moving through the courts in Maryland and North Carolina. Justice Neil Gorsuch, the newest member of the court, likened the court's task in finding a way to measure partisanship with his preparations for grilling steak. "I like my turmeric and other spices, but I'm not going to tell you how much. What's this court supposed to do, a pinch of this, a pinch of that?" Gorsuch asked. A decision in Gill v. Whitford, 16-1161, is expected by spring. This story has been corrected to show the case number is 16-1161.